Thanks to photography, even those of us living in landlocked cities are familiar with the ocean. From shots of sprawling oceans meeting the skies in sun kissed horizons to the panoramic landscape of coral gardens to the subaquatic oddities that lurk where the sunlight can’t reach, we’ve always thought we’ve known how life under the surface looked like — until now. 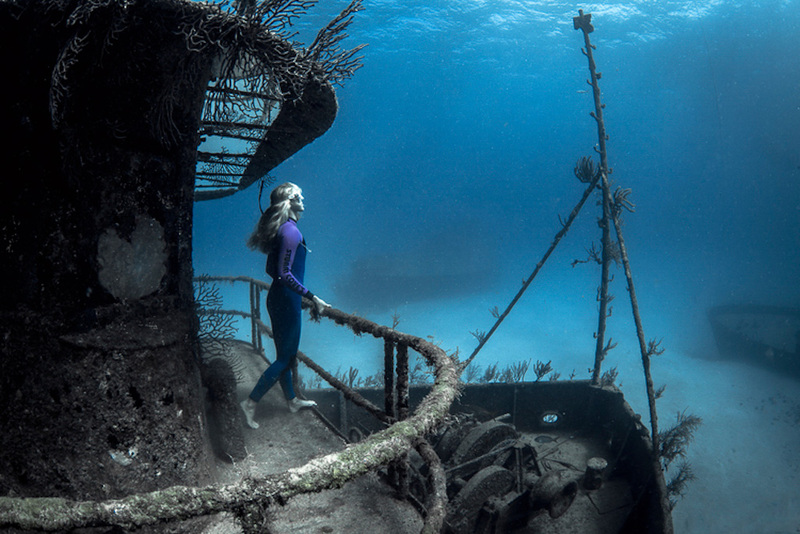 Enter Lia Barrett, a diver and photographer whose depiction of life underwater can only be described in one word – “surreal”, and whose work has completely changed the way one would view underwater photography. 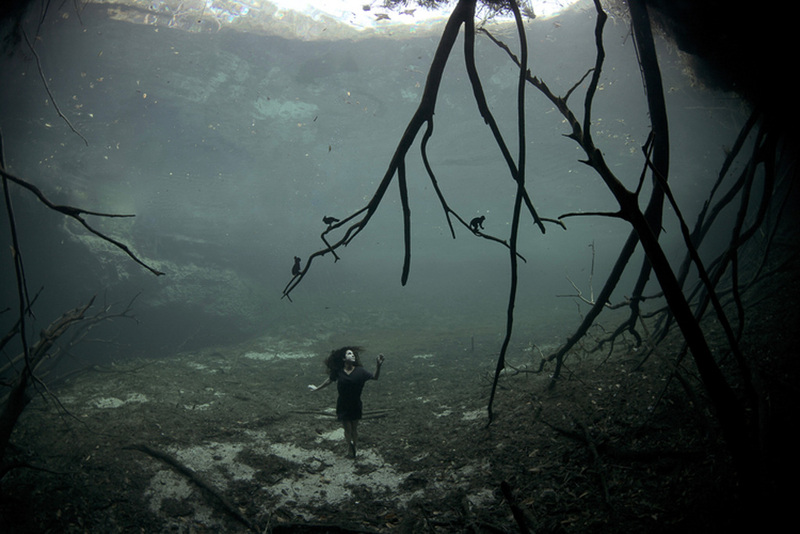 Her series, ‘Underwater Walkers’ is the epitome of such. 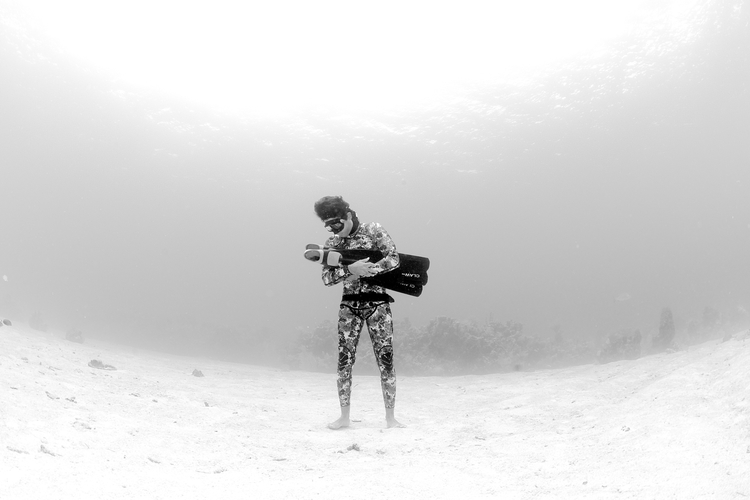 Featuring champion freedivers – divers who can hold their breaths and dive without compressed air — Lia captures them in way that makes you completely rethink the underwater landscape. She achieves this effect because she sees the the sea as a continuation of land, as opposed to an entirely different entity. This point of view she says, “provides a more relatable connection for topside viewers”, and shows a oneness with the ocean that allows us to imagine ourselves reflected in a space we wouldn’t otherwise be able to visualize. It all began when she decided to sink a bunch of porch furniture during a shark dive one day, and sat a couple of her friends dressed in everyday clothing on them. The resulting images made her realize how lifting daily scenarios we are used to and placing them into a completely different environment tickles our senses, and births a hosts of conversations and questions like the limitations of human abilities (the freedivers) and animal interaction (the sharks). After that shoot, the rest was history, inspiring Lia to come up with even more concepts resulting in work that would garner her a massive fan base. Latent talent and techniques aside –she went to Parsons School of Design- it is obvious through her work that there is something deeper at play. 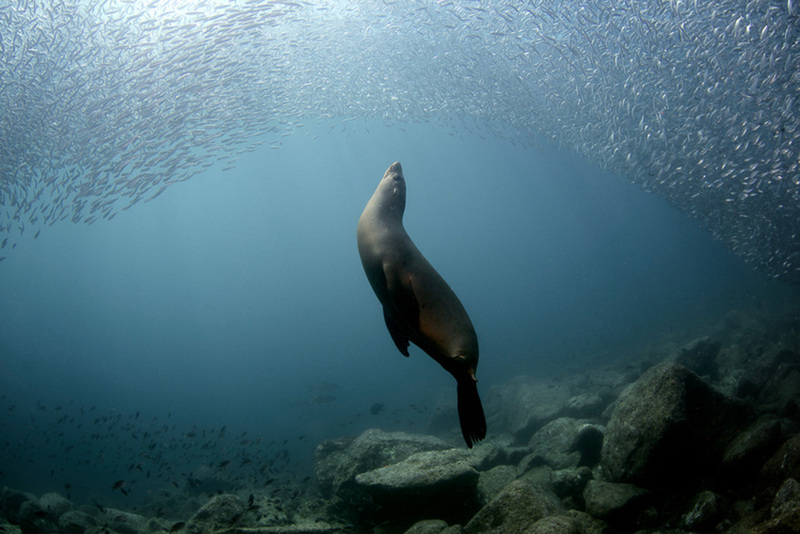 In every photo, her love for the underwater world is evident, and reflected in any image of hers you can find online. 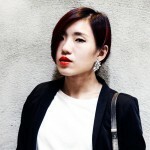 As with most creatives, the past very much inspires the future, and her story is no different. She tells us about her past, of how one of her father’s work trips fatefully took her Hawaii, where she spent most of her time in the sea, snorkeling and chasing fish. Upon returning home, she painted murals of sea life on her bedroom walls, copied from a book by Jacques Cousteau. 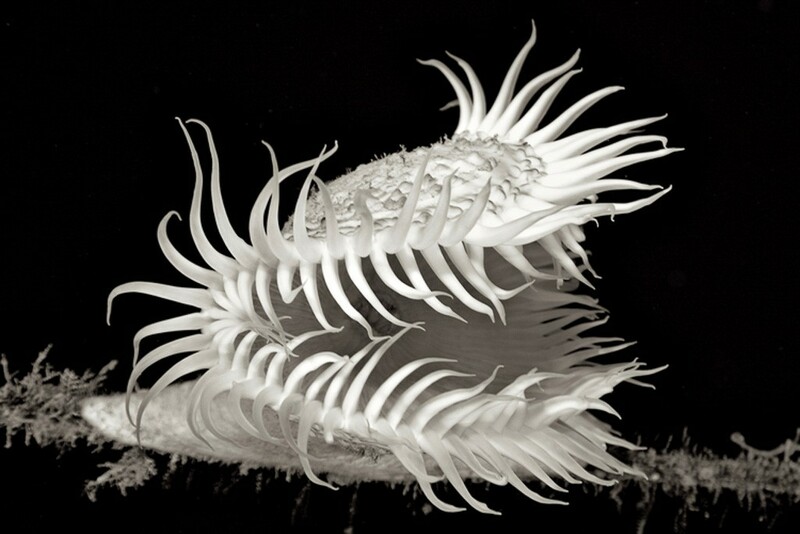 She believes that studying the images over the years led her to the pay attention to the details of the actual photograph, and today, she travels the world armed with her trusty Canon cameras in search of sites for her shoots, having even gone as deep to 780 metres in a submarine in order to capture deep sea life – surrealism in its own rights. But her passion for the oceans don’t stop at just photography. The photo editor for Dive Photo Guide is also the co-founder of Prawno, an ocean lifestyle clothing brand that focuses on marine conservation. The clothing incorporates fabrics made from post-consumer plastic bottles and recycled fabrics, with part of its proceeds supporting projects aimed at improving the conditions of our oceans. While she initially started the label because she wanted a clothing company (and not have to go to class) when she was 18, she later realized that in order to avoid rigid schedules and stay in close connection with the ocean, she needed something that was more serious, more impactful and more tangible, and Prawno was born. Fun fact: the ‘O’ in Prawno is a symbolism of oneness; that we are all connected. And we truly are, with Lia’s work helping to remind us of the fact. The oceans are part of all of us – we depend on it for sustenance, look to it for inspiration and cross it in search of new lives. It is as she says, a continuation of land and an extension of the ground we call home, and it is our duty to protect it so that it can continue to nourish us. If not for all eternity, then at least our eternity. Read the full interview with Lia Barrett here.